What a Great Day was had by all - City West Homes Really pulled out all the stops - catering for kids (funfair and candyfloss) 'afternoon tea' for the 'Seniors' and lots of stalls and music entertainment by amazing singers!! 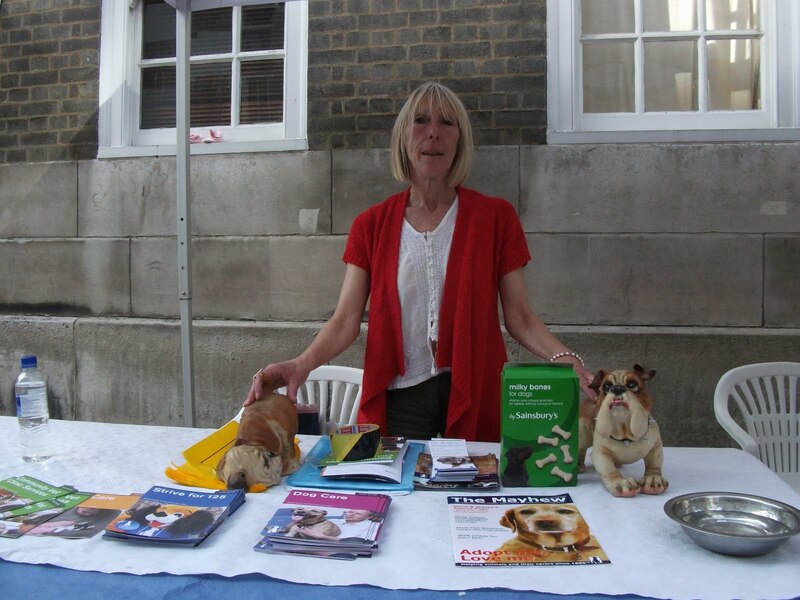 At my 'Dog Advice Stall' I had water for 'thirsty dogs' and 'doggy treats' and gave out over 200 environmentally friendly 'poop bags'! Advice was given on 'dog aggression on lead' 'seperation issues' 'constant barking' 'neutering/spaying your pet - when and at what age. 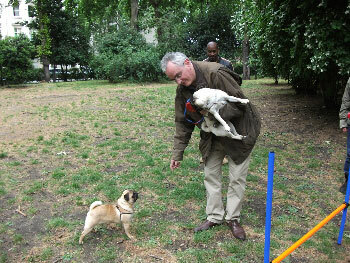 I did a 'demonstration' on how to stop a dog pulling on the lead. 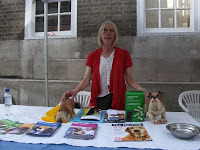 As new 'dog socialising classes' are starting on 17th September 2011 in the 'dog area' in St Georges Square SW1 at 2pm-3.30pm I gave out leaflets with all the details and my telephone number. (Any queries they can telephone me). I have been asked to have a DOG ADVICE STALL by City West Homes in South Westminster during their ANNUAL GREAT COMMUNITIES DAY on Saturday. I will be giving advice on all dog related behavioural and environmental issues' also I will be giving a demonstration on 'dog handling'. Environmental Poop Bags will be given out, as well as access to water bowls for 'thirsty dogs'. Vouchers for FREE neutering/spaying of all Bull Breeds will be available and Advice will be offered on the positives of neutering/spaying your pet and local rescues that do low cost care. I hope you will come along on Saturday, I Promise I am well trained and DO NOT BITE!! It was just the right weather for dogs - not too hot and not raining - We had three German Shepherds from a puppy to a eight year old in the class , beautiful dogs. Satchmo the pup was so happy to be chasing tails of his peers till he was firmly 'told off' by Cedar who had tolerated enough 'puppy play'. We walked round in pairs so I could 'observe' lead control - Thomas the German Spitz was trotting along nicely until he saw another dog (this was a problem his owner had - she said he was unpredictable with his behaviour towards other dogs). I demonstrated with Thomas - how to do the 'block' (using your left foot in front of the dog to block) stop and to relax the lead and using no verbal just 'lead control'. 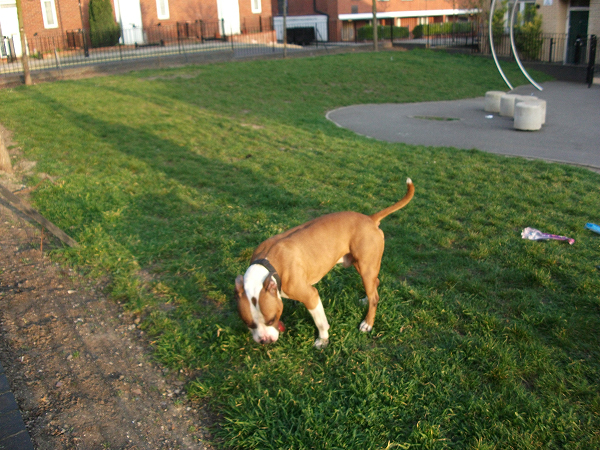 When we reached the secure enclosure in Paddington Recreation Ground - dogs were let off (I was observing them all the time) while they interacted with each other. It is very important to observe your dog and study his body language and learn his behaviour pattern! Dogs back on leads we then discussed individual issues that needed to be readdressed. For example with Satchmo his recall was excellent But he had very bad 'seperation anxiety' (which is probablly why his recall was so good) He didn't want to leave his owners side. I did suggest that maybe it would be a good idea to have a one to one at home so I could see his behaviour and what reactions his owner did when she left him alone. Benji the Maltese Terrier on the other hand was quite happy to be left alone for a few hours But his recall was 'when he was ready to come back' 'if' and 'what time'!! Another 'Free time' off lead in the enclosure then 'doggy homework' given - it was going home time already! Apologies for Absence Daisy and Millie the 'jack russells' Frank the Staffie, Cleo the Mixed Cross and Shadow the Husky. Classes starting again at 3pm-4.30pm and we are all meeting by the cafe in Paddington Rec. All Breeds welcome but NO extension leads please!! We will be getting dogs and owners socialised in the first session, walking on leads to correct any pulling, and discussing diet, grooming and any 'anti social doggy behavioural issues' your dog may have. 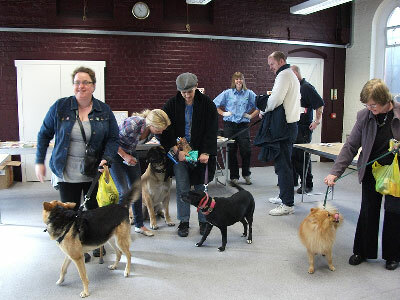 These classes are FREE and funded by the Wards of Queens Park and Harrow Road so take this opportunity to 'learn' using reward not punishment and also to socialise with other dogs and owners. Home checks are not to judge but to help would be dog guardians understand the full commitment of taking on a 'rescue' dog or dogs. To make sure the home environment is secure and safe for both the dog (s) and the guardians -also to advise on how to react to any behavioural issues the dog (s) may have. Most of the home checks I do are on dogs that have little or no 'history' and though most of them have had an assessment by a rescue - once the 'honeymoon period' is over other issues might emerge. Usually all rescues are 'neutered' or 'spayed' and microchipped but if not it is part of the adoption process and is usually insisted upon. Too many 'unwanted' litters end up in shelters worldwide! Also pet insurance is important especially in main towns as you are responsible not only for your dogs safety BUT the public safety; for example 'road accidents' 'dog attacks' 'public liability'. As a home checker I like to do a follow up three months after the pre visit to see how the dogs are but also to check with the owners how everything is working out! I also give out a contact number so that if there are any problems or just a general query I am available to advise. I have over eleven years of experience doing home checks and you are not there as 'judge and jury' - you are there to advise, find out how committed people are but also Listen to people and observe and thats what helps you make 'hopefully' and to the best of your ability - The right decision. For me its what is best for the dog and that the owner has that committment that could be for the next fifthteen years of the dogs life. NB I always STRESS that NO Dog should be left with a child on its own without supervision of an able bodied adult. Both events went really well - gave out advice for 'barking dogs' 'aggression towards other dogs offlead' 'jumping up at strangers' and 'separation anxiety'. On the Environmental side I gave away over 300 poop bags to dog owners and three free neutering vouchers for 'bull breeds'. There was also music, entertainment for the kids - and adults!! Gina from WECH (W9) and Guy from City West Homes (W10) did a great job at the organising of their individual events! Hi All Dog Lovers and 'Learners'!! Once again I have been invited back to WECH's Community Festival in Tamplin Mews Maida Vale W9 and am really looking forward to the Festival that has everything for everyone!! Music, Food Entertainment for all (children, adults and seniors). I will be offering Free Advice on 'dog behavioural problems', giving out information about dog care and the latest on 'dog socialising classes' funded by 'Harrow Road Ward' and local 'dog activities'. There will be information and free 'vouchers' for neutering 'bull breeds' and you are welcome to discuss with me the pros and cons of neutering your pet! Nervous around dogs, Are your children fearful of approaching dogs, Let me talk you through what to do when you see a dog in the street or a local park. Most IMPORTANTLY let me tell you how to Be safe around dogs outdoors and in the home. Hope you can come and enjoy the day, it is a Family Event and something for everyone!!! Come and meet me on my 'Dog Advice Stall' - promise I don't bite!!! Labels: 'dog behavioural problems' 'dog activities' 'Be safe around dogs outdoors and in the home' 'Dog Advice Stall' 'Wech Community Festival. Advice on Dog handling, dog behavioural problems and offering Free 'Neutering Vouchers' to all 'Bull Breed' Owners on 9th July @ Queens Park Gardens. City West Homes have organised a tribute plaque to be placed in Queens Park Gardens in honour of the Queens Park Rangers Football club that first started all those years ago in St. Judes Hall Queens Park. There will be entertainment for the kids and stalls. City West Homes has asked me to have a 'Dog Advice Stall' focusing on 'responsible ownership and environmental issues and also addressing 'dogs' behavioural issues in the community. I will be there from 12pm-3,30pm on 9th July. Was interviewed on BBC Radio by Joanne Good and Anna Webb on 'Barking at the Moon' Live in the Studio on Thursday night!! They were so warm and welcoming and Matilda the English Bulldog and Mollie the Minature English Bull Terrier were gorgeous. Wanted to take them home but my handbag wasn't big enough!! I was talking about my work in schools and libaries educating children about 'acting responsibly around dogs' and 'addressing children's fear of dogs'.My passion and pride in my local community and helping 'young dog owners with their 'bull breeds' and how to have a socialable dog using reward not punishment - and still be macho!! Jimmy the terrier is getting the idea!! Another great day for 'dogs and owners' . The 'Two gentlemen pugs' were more interested in 'treat rewards' than 'working for them'. We had some new members this week!! 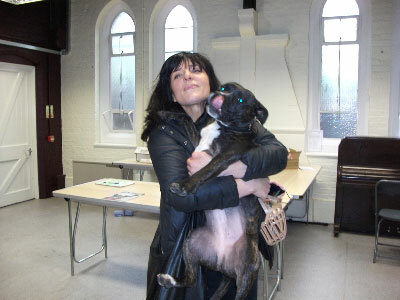 Frankie the French Bull Dog who was quick to know who was 'Boss' - thats right he thought it was him!! Then we had Dorf another jack russell who had never been socialized with other dogs off lead and was very nervous. A latecomer was Fleur who at 14 weeks was ready for action - typical jack russell. Another Bull breed who was much better humoured that his owner (I had him eating out of my hand at the end of the session!!) the dog not the owner!! Jimmy the terrier didn't want to join in (he wanted to play ball) but when he was able to show off his recall he was ready to 'obey the rules'. Classes as well as socailising should be fun for both dog and owner. No owner should be made to feel nervous or stupid and I try to make people in my class feel welcome and empowered and communicate with them to inspire them to want to learn and come back for more!! We practiced 'Walking to Heel' and 'Jumping up' and then Recall, making sure the dogs had their 'Free Time' off lead and socialising in between. 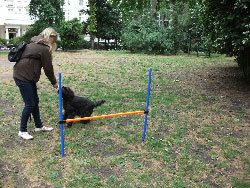 Agility next saturday with the 'Hoop' and the 'Hurdle' and 'How not to Chase Footballs in the Park'. Should be fun - but also will help in training 'Sit' 'Stay' and 'Recall'. Lungworm is a potentially fatal parasite worm that infects many snails and slugs that in turn are eaten by our family pet either by accident or purposely, absorbing the worms into their bodies. The worms absorbed into the body make their way to the heart where they produce eggs which enter the bloodstream and lodge in the lungs. This can cause massive reactions in the lungs and can be fatal if not treated by your vet early. Symptons can be hard to detect early but if your dog has any of these symptons be on the safe side and take them to your vet. What a great day!! My First session for 2011 went really well, eight bull breeds, two jack russells, one beagle, one lab, two rescue mixed terriers and a maltese x - all NAUGHTY but Nice!! Firstly - we discussed any 'behaviour issues' (mostly pulling on lead, jumping up, barking non stop and lack of recall). It was important to assess each dog and see how socialized they were with both other dogs and people, so we all walked round the large 'dog area' (dogs on leads) in pairs - practicing 'walking to heel' and how to use 'the block'. This also was socialising the dogs in a group - walking together. Then the dogs were 'off lead' (under constant observation) interacting with each other. Dogs once 'unattached' to us - humans (who often transfer their own stress to the dogs through 'lead contact') usually interact well with each other. It is often ourselves that 'cause' the problems! 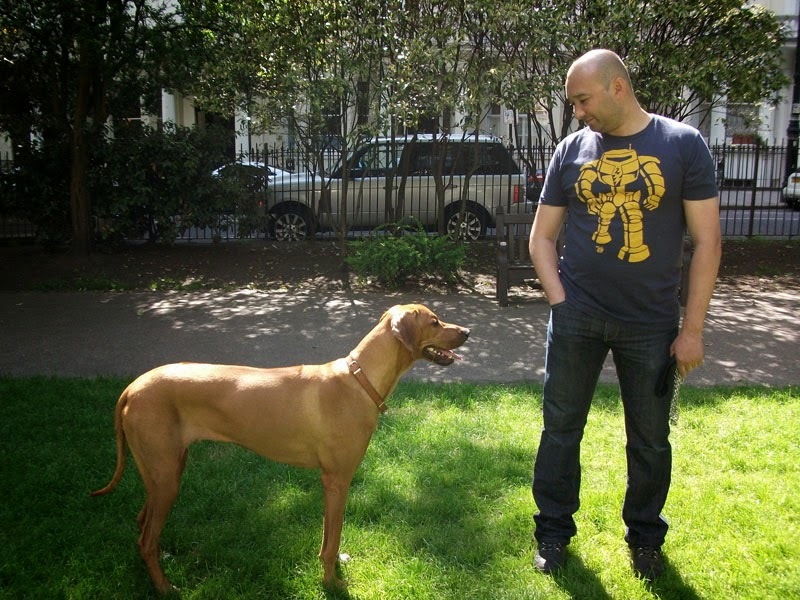 It is important to observe your dog and to understand your dog's body language but also feel confident in yourself. If you don't feel confident and 'stress' free - not only does your dog pick up on your anxiety but other dogs could too and they could react aggressively. Jessie a very pretty staffordshire bull terrier had a problem with other dogs when she was on lead (off lead she was fine) and also having been bitten once by the local bully (a jack russell) - now - was slightly 'anti'! I got her owner to walk round with Romeo the Jack Russell (both on leads). 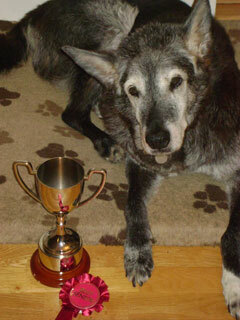 A few growls at first but using no 'negative' verbal and rewarding only 'positive' reactions - Jessie learnt Fast!! Clever Girl. Kane a big softy (Bull Mastiff X) was one of the 'pullers' - more practice needed - gave his owner some 'walking to heel' homework! .Jimmy a lovely rescue has got a 'vocal' problem - Barks for Britain and Romeo he is a pup that joins in!! Whats on the Agenda next week - Barking , Recall and Checking 'Doggy Homework''; can't wait. I will be holding an Educational Event for Children from 5-12 (accompanied by Parents) on Valentines Day. They will meet Missy Blue who will help educate them regarding 'Being Safe and Secure' around dogs and to address any fears some children might have. There will be a competition to 'Draw A Pet' and pens and paper provided and fun prizes to be won! 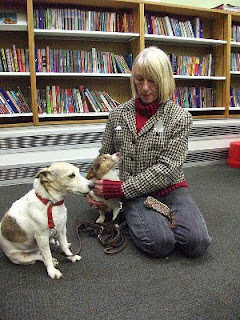 Also they can meet 'Guest Dogs' Josie a rescued jack russell and Frankie a yorkshire terrier - who is a typical male who loves the 'ladies'! These Fun Educational Events are very important and Queens Park library and the local schools all make these events possible by supporting me a 100%.